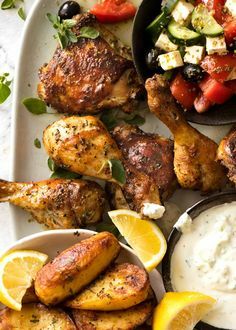 A yogurt marinated chicken that’s beautifully tenderized and infused with terrific garlic and oregano flavours! If you’re new to the magical powers of yogurt marinades, this baked Greek Chicken is going to convert you for life! Brought to you in partnership with Farmers Union Greek Style Yogurt..
Yogurt is a magical marinade! This chicken is golden on the outside, beautifully tenderised on the inside and infused with terrific garlic-oregano flavours. 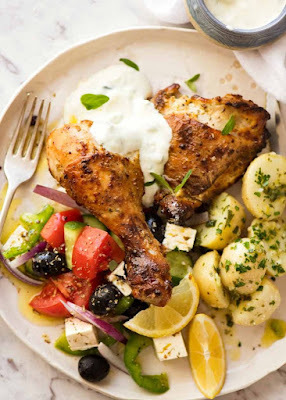 Serve this with a Greek Salad and flatbread - or see in post for a full Greek Feast menu! Marinade time: Overnight, min 3 hrs. Mix Marinade ingredients in a large bowl. Add chicken and coat well. Marinade for 24 hours (3 hours minimum). Line a tray with foil (trust me), place rack on tray (optional). Remove from oven. Brush with marinade - do not flip. Return to oven for 20 minutes or until golden and a bit crispy. Give it a spray of olive oil just before it's done if you want an extra crispy, shiny coat. Rest for a few minutes before serving. Juicy and tasty enough to serve plain but extra great with tzatziki or even some plain yogurt. 1. This recipe will also work great with wings (same cook time and temp), breast (bash with fist to 2cm / 4/5" even thickness, cook 20 minutes at 200C/390F), skinless boneless thigh (20 minutes at 200C / 390F). 2. MAKE AHEAD: Place chicken in marinade, then pop straight into the freezer. Defrost 24 hours in the fridge - during this time it will marinade. Cooked chicken can be refrigerated for up to 3 days or frozen for up to 3 months, but fresh is always best! 3. Based on the marinade from Greek Chicken Gyros. 4. Use Tzatziki recipe in this Greek Chicken Gyros. 5. Nutrition is overstated because it takes into account all the marinade. I have no way of guessing how much of the marinade actually ends up in the chicken. 0 Response to "GREEK CHICKEN"